Letter to H.E. Mr ANDRZEJ DUDA President of the Republic of Poland. Letter to Samdech kittiprittbandit Bun Rany Hun Sen, President of Cambodian Red Cross. Letter to Samdech Akka Moha Ponheachakrey Heng Samrin. 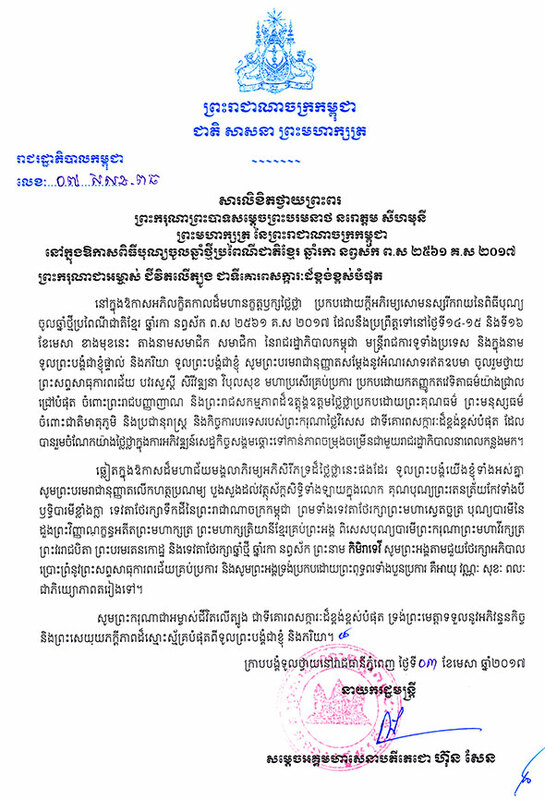 Letter to Samdech Akka Mohasenapadey Decho Hun Sen, Prime Minister of Cambodia Prime Minister of Cambodia. Letter to Samdech Akka Mohasenapadey Decho Hun Sen Prime Minister of Cambodia and Lok Chumtiev KittiprittBandit Bun Rany Hun Sen .
Letter to H.E. Samdech Chaovea Veang Kong Som Ol, Deputy Prime Minister, Minister of the Royal Palace. Letter from Samdech Chaovea Veang Kong Som Ol, Deputy Prime Minister, Minister of the Royal Palace. Letter from Samdech Akka Moha Ponheachakrey Heng Samrin. Letter from Samdech Akka Mohasenapadey Decho Hun Sen and Lok Chumtiev KittiprittBandit Bun Rany Hun Sen.